Alton Brown needs no introduction as the chef/scientist host of Good Eats, the show that taught a generation of kitchen-averse cooks to see food in a totally different way. But his expertise in watches deserves a bit of an explanation. A self-identified timepiece addict (“It’s like crack. It’s bad. I have a problem…”), Brown applies his trademark objectivity when buying a watch. It can’t just look good; it has to work great, and often for a lot of purposes. A reliable watch is important whether you’re an enthusiast, a pilot (he is), or the timekeeper on every season of Food Network’s successful Cutthroat Kitchen. And as always, “no unitaskers,” especially on his wrist. We seemed to only scratch the surface of Brown’s obsession as we talked about his favorite vintage pieces, why he won’t allow a clock in his TV kitchen, and how he hunted down and restored a stolen family heirloom. Your Instagram account seems to be a mix of donuts, coffee, and watches. I’ll be really honest: I’ve been a watch geek my whole life, from the very first Timex that my dad gave me when I learned how to tell time. I learned mostly because I wanted a watch, and I’ve been that way always. My ravenous appetite for vintage timepieces is… it’s like crack. It’s bad. I have a problem and cannot stay away. I have to very much limit myself. You’ve seen me wear a lot of different watches, most of which I don’t own anymore. Here’s an interesting tidbit: I used to change watches every season on Good Eats because it made it very easy to recognize what season each show was from. It would be like, if one came on and we were going through footage, we would actually identify the season by what watch I was wearing. We had a chart. It changed every single season. There was one season where it gets messed up though, where I actually had a watch break down. I had to switch mid season to another one and the script woman I worked with said “you know you’re going to have a problem.” So I went back and wore the other watch broken for the rest of that season. Which really messed me up because, as director, I’d keep looking at my watch and go, “Oh, dammit.” [laughs] And I won’t mention the particular brand. I feel like I need to re-watch the series just to identify the brands. With Cutthroat Kitchen, is it the same thing? The thing about Cutthroat Kitchen is I’m actually the official time keeper on that show. It is actually me with a watch. And I refuse to buy an Apple watch or use some digital device. Of course, each show has half-hour rounds that have to be counted down, and there aren’t that many countdown chronographs in the mechanical watch world. There just aren’t. There are regatta timers, and I’ve used some of those, but by-and-large you’ve got to do a little math in your head because most chronographs are made to count up, not down. That’s the way it is. So for Cutthroat Kitchen you wanted to cycle them in and out, too. Over the seasons I keep trying different watches to find what’s the easiest one for me to read, you know — accurate and dependable. Every now and then, something happens and we have to stop the action, sometimes for sabotage setup or someone cutting themselves, so I need a watch that can take — god help me for saying it — take a licking and keep on ticking. That’s sometimes tough with vintage pieces because a lot of them just aren’t meant to be punched around that much. I’ve actually been in the middle of timing a round and watched one of the sub hands on a 1967 Speedmaster just pop off, because they’re old, you know? I adore the older movements, however I am now, after long debate and looking around, pretty sure I’ve settled on the IWC Portuguese that I use now. Looks great with suits, comfortable to wear, relatively thin, big enough for a guy in his 50s to read easily. I think I’m done. I think I’m going to stick with the Portuguese for a while. 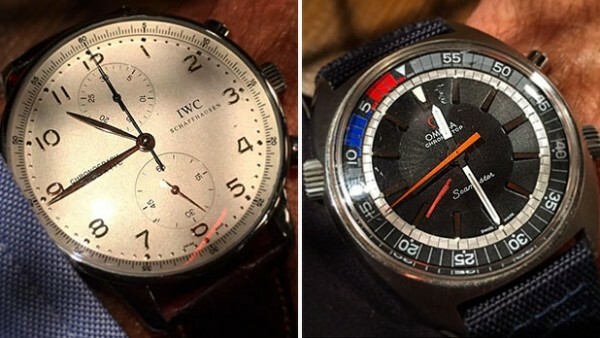 Brown’s ‘Cutthroat Kitchen’ IWC Portuguese (left), and his father’s Omega Seamaster. Does keeping time yourself help you keep better control over what’s going on? It’s actually a matter of efficiency because I am there on the floor, the chefs constantly want to know time, and I didn’t like the idea of some big digital clock hanging in the studio. Then the competitors simply fixate on looking at the clock. I’ve seen that happen on other shows, so I didn’t want a physical clock on the set. So, I mean, what are the other options? I do use a backup in case something were to happen. I do still keep my phone in my pocket with a timer running just in case something breaks. But the truth is it’s simply a matter of efficiency. Otherwise I would have to wait for somebody in the control room, and they’ve already got plenty to do, to give me the time, and by the time they give it to me, it’s probably too late. Very often during a challenge, the control room will call me on my earpiece and ask me how much time we’ve got left. How many would you say you have now in your personal collection? I don’t hoard. And I don’t like hoarding, so I trade a lot. There are very few pieces that I’ve decided to simply keep forever. I’ve sold literally… last year I probably got rid of 15 watches. I do a lot of business with one particular vintage place in Los Angeles, Wanna Buy a Watch? I’m probably down to the fewest pieces I’ve ever had. I have maybe ten. I currently own no Rolexes, which is odd. The one Patek I had, I no longer have. My everyday watch is a beautiful late-1950s Ulysse Nardin with a gray face that’s kind of become my watch. I’m also wearing a mid-60s blue-faced snowflake Tudor Submariner. I actually prefer Tudor Submariners to Rolex Submariners. I do have a Breitling Aerospace because I’m actually a pilot, and I use the gosh darn thing. To me these are tools, not so much fashion pieces. What else do you keep around? My dad passed away when I was a kid, and died with his Omega Seamaster on his arm, so I wear his watch quite a bit. I’m kind of iconoclastic. I don’t own big watches. I have relatively small wrists, and I think I look really silly in anything over… 40mm? I guess that’s the biggest thing I own. It was stolen when I was in college. My apartment was robbed and the watch was stolen. And a few years ago I found the watch on eBay. The movement numbers matched my records. I found his watch on eBay after 20 years. And I bought it. It was from a place that sold almost scrap watches. They sold it as running; it wasn’t. It got sent away. Omega spent damn near a year getting original parts and rebuilding the watch, and it still wasn’t right. And my friend in L.A. took it, and now it’s back to mint condition, exactly as it was when my dad died. Quite an odyssey for that watch, and I will never ever ever ever ever part with it. Is there a watch that has eluded you? [Laughs] Oh, there is. I would love to have any watch made by F.P. Journe. I mean, those watches are absolutely… they look like Jules Verne made then. A little spendy for me, but I’m hoping one day to find a woman who loves me enough to buy me a Journe. Nobody is making watches that look like that. To my mind, any number of the Journes are the most beautiful watches being made right now. And the movements are… it’s like looking inside god’s head or something. The other watch that I would like to have: I’m in love with the Omega Blackout Ceramic Edition of the Speedmaster, the one where the body’s actually chiseled out of cubic zirconia. You pick it up and it is so light and so beautiful. Where would you advise a budding collector to start for a good, reliable piece? For someone who’s just starting to get into it and really wants to learn, I would highly suggest a vintage stainless steel Rolex, because you can’t beat the Air King line for just a medium size, straight forward, stainless steel — but with a really, really great movement. A chronometer from the ’70s. They haven’t changed that much. And you can start to learn about movements. You can wear it anywhere, anytime, they’re tough, they run. The fact that I don’t own one right now is actually kind of an anomaly because the Explorer is kind of, like, probably my all-time favorite watch. If you’re going to start with a chronograph, I think every collection needs a Speedmaster. I think they acquire a nice patina, when that face starts to fade. My big thing in vintage watches is finishes that have faded in interesting ways. I don’t like my watches to look new. Most of us who are just starting aren’t going to drop 10-grand on our first piece. So look to spend $2,000–$3,000 — you can get yourself a decent used watch. Camp Cutthroat premieres Wednesday, Aug. 12 at 9 p.m. on Food Network.